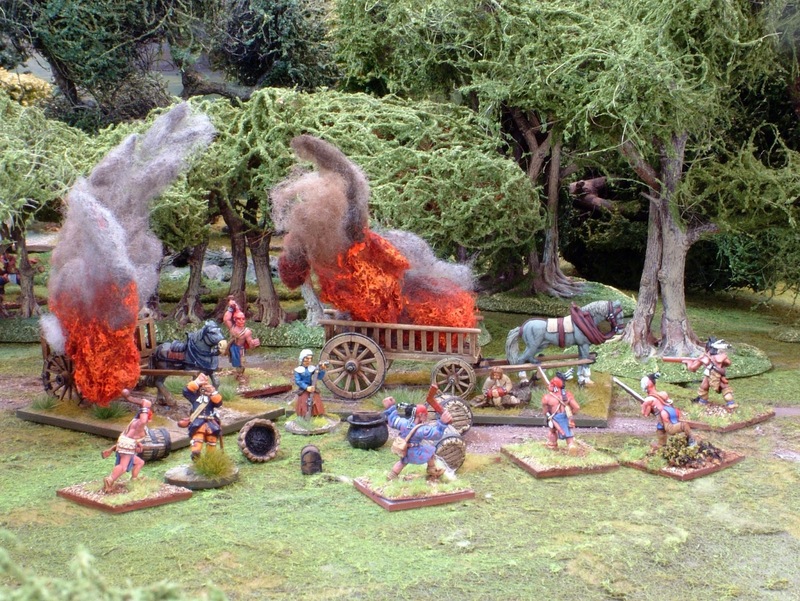 David O'Brien - Following on from my previous article, Paint your Wagon here is a scenario that shows wagons not only in action but taking the prime spot in the action. 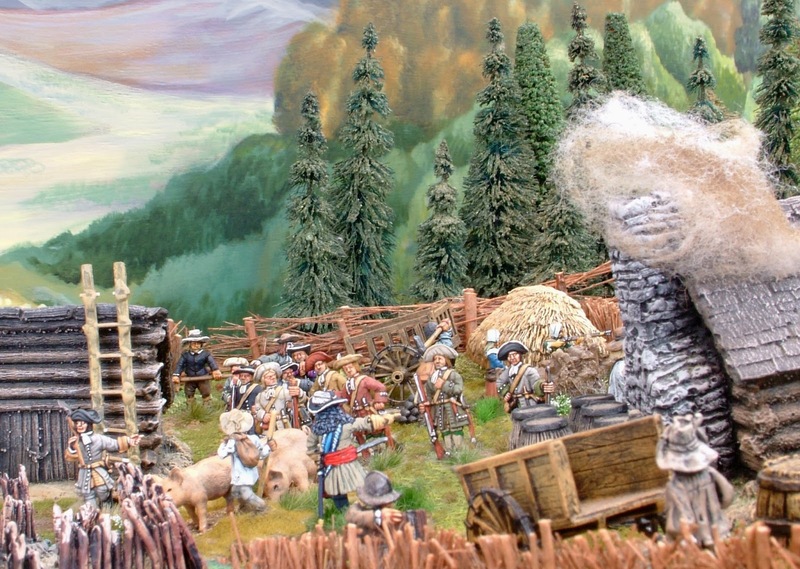 This action takes place somewhere in North America in the 1680's and pits English armed frontiersmen and soldiers facing off against native Americans. 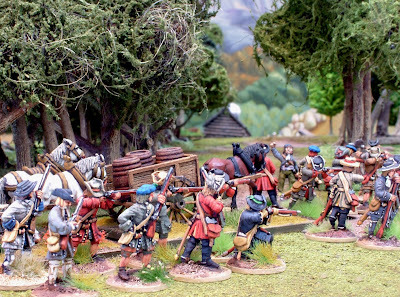 The English forces have been off raiding French settlements and two wagon loads of booty are being carted back to their own territory, unfortunately the natives can spot an easy target when it comes within reach. There was also a small recruit force of civilians guarding the village but they would only fight if the natives attacked them, they could not leave the settlement and could not shoot in support of my men. These were just the forces we used but if you have enough figures then feel free to use more drilled warriors or if you're feeling rash why not try five units of young warriors. 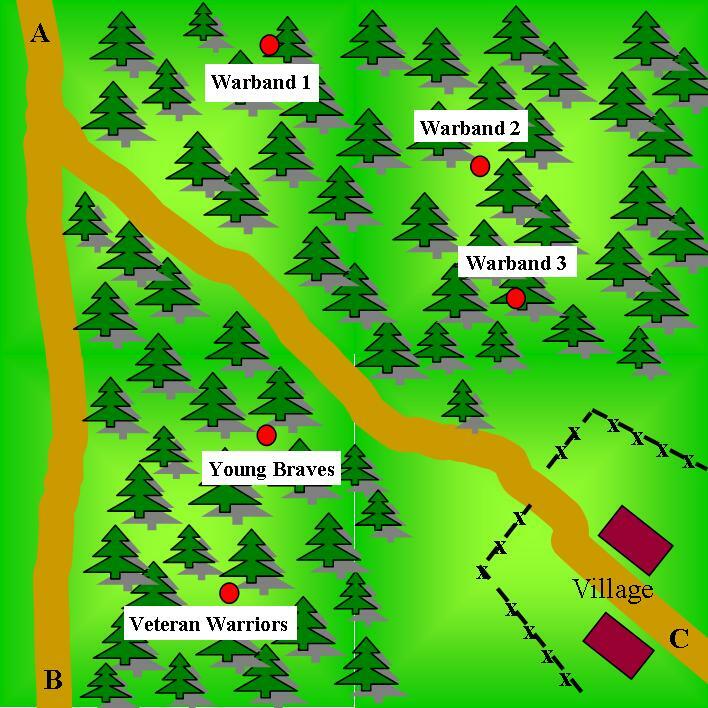 We diced for where the natives had to set up and they ended up in the positions marked on the map, they had to be at least 12" away from the road and away from the clearing around the settlement. 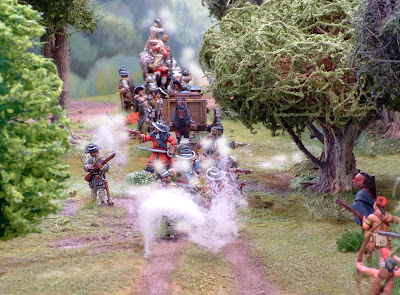 Every unit, each wagon and each character had its own card for movement as well as a reload and end of move card. The English militia unit would only appear after the third move and needed a 10+ on 2d6 to arrive with an extra point being added each turn, once they arrived they were diced to see if they would arrive at B or C.
The game started well for the English as the first native warband 1 unsuccessfully attacked the first units onto the table and were in turn counter attacked and destroyed by two drilled English units. Meanwhile the native warband unit 2 moved across the road and joined the young braves and veteran to block exit point B which had been my preferred exit point so I changed my plan and headed for point C. I had thought this would have been a good decision as the majority of natives were now around point B and when my militia arrived at that point I thought I could use them as a sacrificial unit to tie up as many natives as I could. Unfortunately things started to unravel as either the wagon cards didn't come out or wagon 2 would come up but it couldn't move past wagon 1 and as I couldn't leave the wagons undefended it also slowed up my infantry units. Who came up with this stupid scenario in the first place??? The militia didn't perform there job very well either as after taking out 2 of the veteran natives and the great warrior in the first round of combat they failed to hit anyone in the second round of combat and promptly failed their morale test, especially with the War Whoop going on in the forest around them. Even worse was that it now released the natives to move back to cut off the road to exit C.
As my troops slowly plodded on to exit point C the natives started to close in from both sides and fierce hand to hand combat and fire fights erupted up and down the road with many deaths on both sides and many warriors went to the happy hunting grounds in the clouds. The crew of wagon 1 had been wiped out by this time and the wagon captured by the natives but quickly recaptured by the English and just as quickly lost again. By this point in the game the natives only had warband 3 surviving and the English only had half of drilled unit 3 left and both wagons had not lost their crews and the natives were closing in. It was now turn 17 and as I was about to move my last troops in to save the wagons they went down in a hail of arrows and below shows the final outcome of what was a fun filled game with the final outcome in the balance until that final move. There are a few variations that can be added to the game and we used the first one in our playtest. 1. 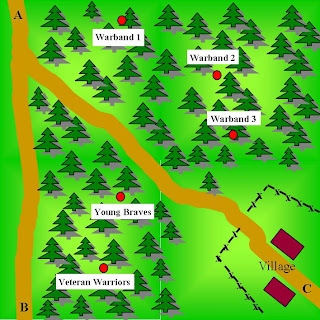 The Young Warriors have to test every move to see if they stick to the plan to capture the wagon or get distracted and decide to attack the homestead instead. I would suggest they have to pass a morale test to carry on against the wagons. If you wanted you could even have all the natives troops having to make this test but I would suggest that if they pass the test in the first move they can then act as they want for the rest of the game. 2. I would recommend that you only use one card for the wagons and that both wagons get to move when the card comes up, this would stop some of the delays in our game where the rear wagon couldn't move because the card for wagon 1 hadn't come up. 3. Another option if you have the models is to use three wagons which would be worth 10, 20 and 30 victory points, these should be marked down before the game starts and only the English player knows which wagon carries which points. 4. The usual rule for testing for the end of the game when a force loses 50% of its troops was not used in our game as we wanted to concentrate on the wagons but feel free to use it in your games if you wish. 5. We had originally decided to have a time limit of 15 moves on this game but as the lead wagon had only managed to move 6" by the beginning of turn 5 we decided to drop the idea but if you use the option of one card allowing all the wagons to move then perhaps a time limit before darkness falls would add even more excitement to the action. As usual, if anyone tries fighting this scenario I hope you enjoy it as much as we did and I would love to hear how you got on and any other ideas that you might have added to the scenario.